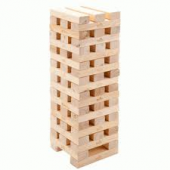 Below is additional information on the hire item "Jenga Game Mega Hi-Tower". Description Mega Hi-Tower is a Jenga style game that comes ready-packed inside a zip fastening canvas bag, perfect for carrying the game around. The game consists of of 58 pine wooden blocks. Each measuring 18cm x 6cm x 4.5cm. At 0.9m high and can be built up to 2.3m high (max). It is a thrilling and tense game that requires a steady hand to beat your opponents. Volume Price £ 18.50 for orders of 5 units or more.